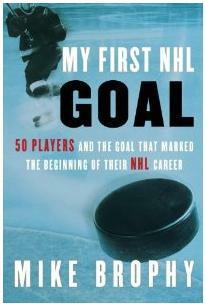 Veteran hockey journalist Mike Brophy returns to bookstore shelves this winter with My First NHL Goal: 50 players and the goal that marked the beginning of their NHL career . Every player who ever scored in the NHL has a different story about his first goal. For some, like Wayne Gretzky, Gordie Howe, or Phil Esposito, their first goal was just one of many they would score in their long and illustrious careers. For others, their first goal was also their last. Sports journalist Mike Brophy has interviewed fifty players about their first NHL goal, and the result is a wide-ranging wealth of personal stories that include high-profile former NHLers and many of the game’s best players from today. Some players, such as Chicago Blackhawks captain Jonathan Toews, scored in their first NHL game. Others were not so lucky. Jim Vesey, for example, scored his only NHL goal into an empty net. With lots of direct quotes from the players themselves and Brophy supplying the tantalizing background information and career highlights, this book is a nice biographical collection of hockey stories that can enjoyed by everyone. Mike Brophy is a hockey analyst for Rogers Sportsnet, a syndicated columnist and twice-weekly analyst for The Team 990 in Montreal. Brophy covered junior hockey for the Peterborough Examiner for 14 years and served as a senior writer with The Hockey News for 17 years.